Our readers know we love a good IKEA hack. So to kick off spring, we rounded up a fresh new batch of budget-friendly furniture transformations that feature some of your favorites, which will turn your bedroom into a peaceful (and pretty!) escape. It’s time to update your bed linens, add some color to your space and give some love to those items you’ve neglected all winter long. These IKEA makeovers will get that done and more! A new headboard can make all the difference in revamping your bedroom into the stylish oasis you’ve been dreaming about. Here, an outdoor bench cushion was repurposed into a sleek, minimalist-inspired headboard by wrapping it in good-looking fabric (this blogger chose denim) and hanging it with leather straps above the bed. It’s really that easy! Hand-sewn pom-poms convert a simple IKEA throw into a more dressed-up bedroom accent. Follow these simple steps to make this DIY pom-pom blanket. A sharpie is all you need to convert this cushion cover into an on-trend mudcloth pillow. Some artistic talent wouldn’t hurt either, but the great thing about this textile design is that the patterns are supposed to look free-hand, not perfectly identical. Pretty storage solutions on a shoestring budget? Yes, please! If the light wood surface of this simple cubby isn’t quite your style, coat it with a fun geometric print for a more modern feel. Set it on your desk or vanity to stash offices supplies or makeup essentials. How do you make a $60 coffee table look high-end? Wrap it in lush pink velvet fabric and repurpose it as a bedroom bench, that’s how. Finish with metallic gold painted legs to lend to an even more glamorous look. Follow these instructions for the DIY bedside bench. Impart your bedroom with a boho chic vibe, courtesy of this ingenious DIY! With a few legs and some glue, you can transform the Sinnerlig pendant lamp into a sculptural accent. Colorful yarn tassels gives a woven rug a fresh spin with colors inspired by the season. Get the full details on how to recreate the look here. Yarn and copper spray paint turn the Sekond cord set into a style-focused pendant light that extends a polished detail to the space when wrapped around pretty hooks at both sides of the bed. Find out how to make the yarn-wrapped pendant lights here. Store anything from office supplies to extra toiletries in these collapsible textile baskets made from an IKEA rag rug (it’s only $6.99!). It’s the perfect small-space storage solution that is equally stylish and affordable. For the all-white bedroom that suddenly feels bland, add some excitement to it with a nightstand in a fresh pop of color. Pastel pink paint and color-blocked legs add a lively finish. 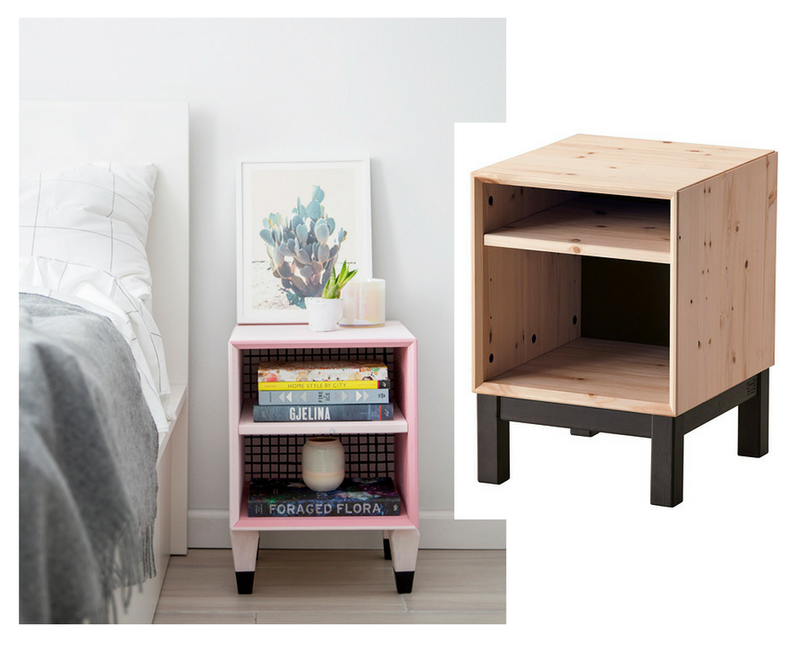 Get step-by-step instructions for the DIY Nornas nightstand here. This Mid-Century mod-inspired cabinet makes for an ultra versatile storage solution, which can live within a wide array of decorative styles!